Fishing pliers tend to be the most forgotten tools when out fishing. 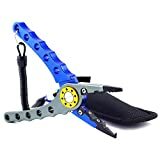 However, they are essential tools that play a crucial role especially when you need to extract hooks from the fish, cut a fishing line or set up split rings. They are an indispensable tool that every person going fishing must have with them. This tool makes fishing a lot easier lessening most of the tasks. However, you need to choose only the best fishing pliers on the market to get the best use out of them. With the market filled with a broad range of fishing pliers, choosing the right one might seem an uphill task. However, this review narrows down your search to ten that we think are the best on the market currently. Read through and choose one that you think best suits your needs. The Pisccifun is one of the best-selling fishing pliers out there and one you must add to your fishing arsenal. It is a pretty solid plier made of the aircraft-grade anti-corrosion aluminum to serve you for years. The pliers feel pretty light and offer excellent long-term use. They feature the replaceable tungsten cutters which are quite sharp and easy to cut some of the toughest splitting rings and hooks. Overall, they are a great buy coming with a lanyard, belt loop and a nylon sheath. This is a classic fishing plier with a basic design that helps solve most of the fishing problems with easy. It features quality plier jaws that can also work as tool pliers and help you hold objects firmly. The cutters of this plier are pretty sharp and feature a lock for safety purposes when not in use. They are pretty small pliers measuring 6.5 inches and feature a spring loading for easier handling. Overall, the Booms fishing pliers are a sturdy selection with a stainless steel construction for long-lasting use. The X1 Booms fishing plier is another top-quality selection made of the durable anodized aluminum metal. The plier is anti-corrosion and rust resistant working well in both the fresh and salt water. The pliers feature a braided line cutter of 70 plus HRC tungsten. The cutters are replaceable and ideal for cutting through the toughest braided lines. The jaws also feature a stainless steel carbon inset for durability. Serration of the jaws gives a firm grip and allows you to finish most of the tasks out there with ease. 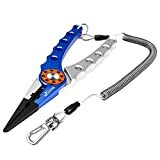 The RUNCL floating fishing pliers is an excellent choice that will never get lost in the waters accidentally since it floats. 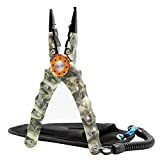 It is a valuable 5-in-1 gadget that works as a weight crimper, split ring pliers, hook remover, fish gripper and fishing lining cutter. The carbon steel is corrosion and rust resistant and features a perfect finish for safe use in salt waters. The long nose design is ideal for a deeper reach in the waters. 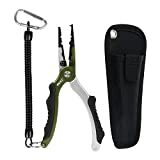 Overall, this plier is quite easy to carry and comes with a nylon sheath, belt loop clip and curled lanyard. This is a pretty cheap choice for use in both salt and fresh waters. It is a simple design plier but one that will help you accomplish a wide range of uses. The cutting edges of the pliers are made if the high-quality stainless steel 3CR13 for better gripping and cutting. It is easy to use on both the left and right arm. You can easily carry it in a nylon belt pouch for use on every fishing trip. Overall, this is an excellent buy with a 24-month replacement warranty. The Zitrades fishing pliers is another highly rated selection with a special deluxe aluminum gripping body for durability. 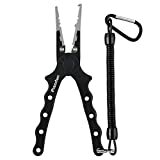 The plier’s design is specific for fishers looking to complete various tasks when fishing. It is a very portable plier with a skid proof handle for easy operation. The pliers is bright and lightweight making it the ideal fishing pliers. It comes with a lanyard, belt loop and holder so that you will never forget it. This is another high-quality aluminum alloy pliers with an oxidation treatment to prevent corrosion and rusting. It is a versatile pick for use in salt waters. It rarely scratches and will serve you well offering you excellent value for money. The plier is multifunctional and can serve as a braid line cutter, press leads, split ring opener and hook remover. It features a spring-loaded handle and is quite easy to use and handle. A belt loop on the sheath back ensures you have it with you everywhere you go. This coupled with the 100 percent satisfaction guarantee makes this plier a great buy. 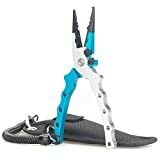 This is another pretty durable and rust-proof aircraft grade alloy aluminum metal pliers for powerful and convenient use. It is corrosion and rust resistant making it ideal for use in salt and fresh waters. 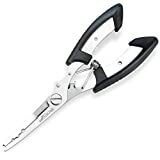 The stainless steel curved jaws of the pliers help split rings and cut hooks fast. The cutters are tungsten carbide and sharp enough for fast cutting. They are replaceable and can cut almost all wire types. They also feature a safety lock that prevents the pliers from hurting you when not in use. This is a reliable Rapala fishing pliers designed to serve you for many years. 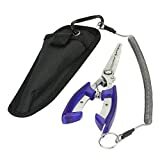 It is a pretty solid and lightweight pliers with easy operation. The plier features a durable carbon steel metal construction and a nickel plate finish. The grips of the pliers are co-molded for ease of use and convenience. Overall, this is one of the best fishing pliers out there. It is lightweight, easy to use and sturdy for a wide range of jobs. 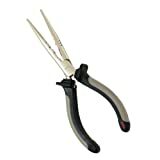 The Runcl fishing pliers ends our fishing pliers review with an excellent ergonomic design of the PVC handgrip handles. It is an excellent feature in this plier that allows for better traction and operation. The construction of these pliers is the quality aircraft-grade aluminum which is corrosion and rust resistant. They are an ideal choice for saltwater surroundings. 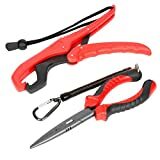 You can use this plier on a wide range of tasks like fish gripping, braid line cutting, hook remover, splitting rings and as a weight crimper. The braided tungsten cutters are sharp and easily replaceable. A fishing plier is a must-have tool if you love fishing from time to time. It is an essential tool that helps you accomplish several tasks leading to a successful fishing trip. Make sure you read our reviews before choosing the best fishing pliers to get full value for your money. Read more about the fishing backpacks.